I hugged my sisters and they fit against my sides like two jigsaw pieces that would never fit anywhere else. I couldn?t imagine ever letting them go again, like releasing them would be to surrender the best parts of myself. Three sisters share a magical, unshakeable bond in this witty high-concept novel from the critically acclaimed author of Audrey, Wait! Around the time of their parents? divorce, sisters April, May, and June recover special powers from childhood?powers that come in handy navigating the hell that is high school. Powers that help them cope with the hardest year of their lives. But could they have a greater purpose? April, the oldest and a bit of a worrier, can see the future. Middle-child May can literally disappear. And baby June reads minds?everyone?s but her own. 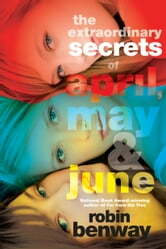 When April gets a vision of disaster, the girls come together to save the day and reconcile their strained family. They realize that no matter what happens, powers or no powers, they?ll always have each other. Because there?s one thing stronger than magic: sisterhood. THIS IS ONE OF THE BEST BOOK I HAVE EVER READ!! I could't mysdlf frm reading. I recommend this book to everyone. Loved it!